I've been following David Hobby's Strobist Blog recently as I've started down the road of using off camera flashes instead of full sized studio strobes. On sites like Flickr you'll often find people listing their "strobist info" along with their photos to explain a little about how they shot it. On rare occasions you'll find detailed diagrams of the setup, this post is going to give you the tools to make the same thing. First you'll need a program called Google Sketchup and with that you can open this template I made. 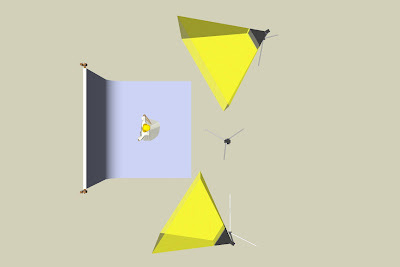 Contained in the template are a backdrop, two softboxes, as well as a 3d model of a person*. If you're familiar with Sketchup you'll know how easy it is to tweak and modify this to suit your needs. If you've never used the program before I'd recommend going through the tutorial that pops up the first time you open it. This little program is easy to use and its very powerful, I've used it to design countless DIY projects and even plan renovations in my house. *To trim the size down on the template I used a low resolution model of a 3d person that is included in the basic sketchup library. The 3d person shown in the image is downloadable via sketchup, just do a search for "3d Woman" and you'll get quite a few results.